For those of you “experienced” enough to remember those TV jingles from the late 1950’s and 1960’s, you might remember the Chevrolet commercials featuring Dinah Shore singing “See the USA- in your Chevrolet”. So- a little backstory (And I promise there will be a real estate angle!). 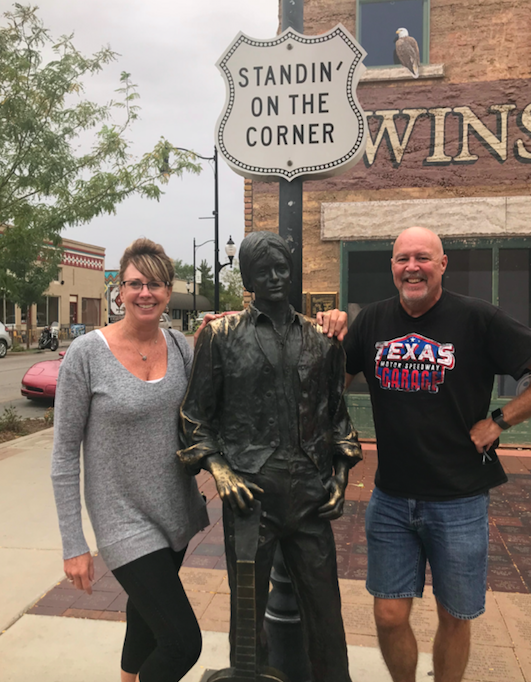 Jan and I had been planning a trip to Las Vegas this fall to meet up with some great friends and for me to attend the NASCAR race that weekend. After our spring road trip to North Dakota, we decided to drive instead of fly. With the decision made to drive, and our newfound penchant for getting off the Interstates, Jan started looking for a convertible to rent and drive to Vegas. Then we would fly back. 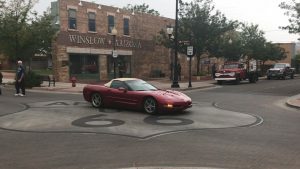 Well, it didn’t take long to realize that was not a cost-effective way to travel! We quickly realized we could buy an older convertible, drive it to Vegas and back, sell it, and still come out ahead! 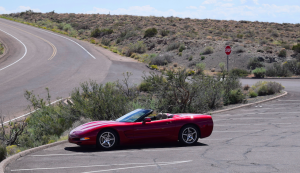 So, the search began, and a few weeks later, a beautiful older 2004 crimson Corvette (we are both ‘Vette fans and have owned several in the past) is sitting in our garage, and we are deep diving into plans for the trip. 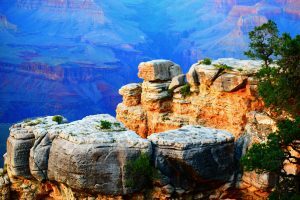 We added a couple of days along the way at the Grand Canyon- scratching off an item from Jan’s bucket list. We HIGHLY recommend the Grand Canyon Railway and Hotel. Our trip started with a couple days in Dallas for a real estate conference. When the conference was over, we headed out of Dallas getting on the 2-lane roads as soon as we could. 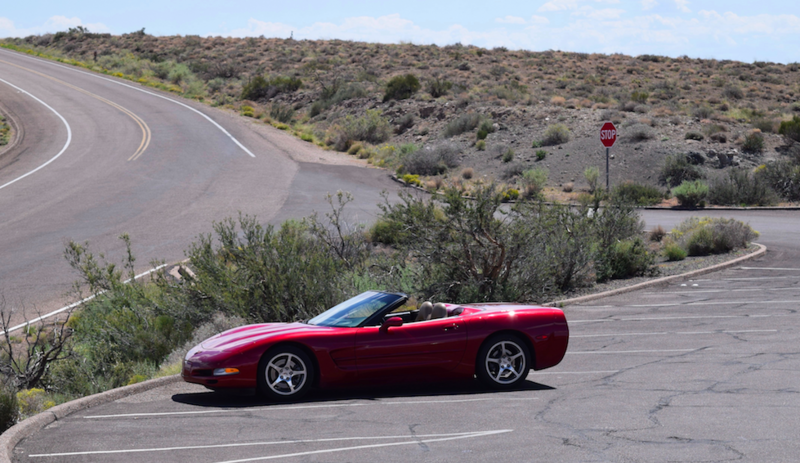 We angled northwest for a stay in Santa Fe New Mexico before heading to the Grand Canyon and Las Vegas. Along the way we traveled as much as possible on old Route 66, stopping at the roadside joints, eating in the local diners, and visiting several Route 66 museums. 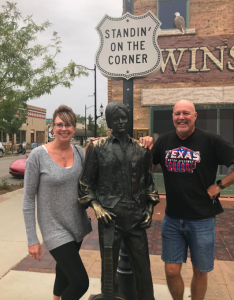 Of course, we had to “Stand on the corner in Winslow, Arizona”. So how does real estate play into this trip? Jan and I have finally used up the last of our Holiday Inn and Marriott points from our corporate days and have fully embraced Airbnb as our travel stop of choice. We have yet to have anything short of an awesome experience! We have had an entire floor of a hotel to ourselves and stayed in some beautiful homes. Our hosts have been awesome and provided great local recommendations. On this trip to Vegas, we had a perfect Airbnb for a “recharge” day to do laundry and catch up with work. We stayed in Amarillo our last night out and got a head start on unpacking and catching up. 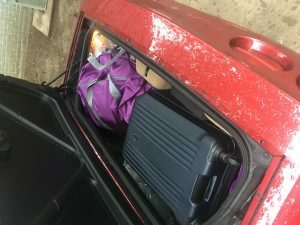 Here are a couple of links to our Airbnb Rental’s that we used. Cute & Cozy Historic Downtown Arizona and The Oasis at Wolflin. Being in real estate and being real estate investors, we began asking ourselves: “Should we invest in property for an Airbnb rental?” As we discussed the pro and cons, costs, return on investment, and all the other pieces of real estate investing it dawned on me that everywhere we stayed during the trip, there were investors who had determined real estate was the best place for them to invest. The Airbnb’s we stayed at were most likely, locally owned. They showed the owners pride and sweat equity… probably an investment of around $100,000. In Vegas, we stayed at the Palazzo/Venetian complex- an investment of billions of dollars! Real estate investing can be tricky, and it’s not for the faint of heart. Investing in real estate doesn’t guarantee a big return on your investment. That said, one of the greatest tools for building personal wealth is still homeownership. There will be bubbles like was seen in California, Las Vegas, Arizona and other areas in the early 2000’s, but for-the-most part, homes will appreciate over long periods, owners will build equity over time, and your home will become your biggest asset. Jan and I and our team would love to help you with your real estate investments. From first-time homeowners to multi-unit apartments, to light commercial- we can help! So, will we be investing in our own Airbnb? Who knows? We are certainly considering adding an Airbnb to our portfolio. And for those of you who want to know…. Yes! You can fit two weeks of luggage for two people into a convertible Corvette and still leave room for the top to come down. And… Yes! The ‘Vette has found a permanent home in our garage. And…. Yes! Planning has already begun for the next chapter in our “See the USA in our Chevrolet” adventures! East coast here we come!